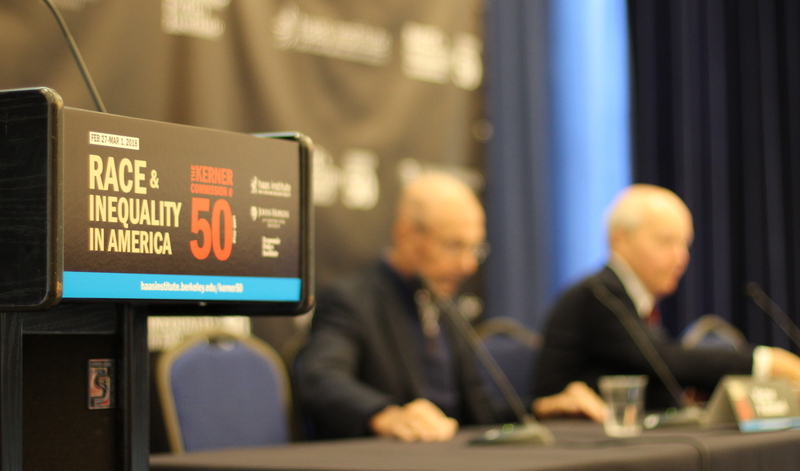 The Haas Institute is compiling links and excerpts from news articles, opinion pieces, and other media appearances around our "Race and Inequality in America: The Kerner Commission at 50" Conference below. Read more about the conference on this page. "Conference reflects on racial inequality in U.S."
The Hopkins 21st Century Cities Initiative partnered with the Haas Institute for a Fair and Inclusive Society at the University of California, Berkeley (Berkeley) to host a conference titled “Race and Inequality in America: The Kerner Commission at 50” on Feb. 28 and March 1. The Conference sought to engage attendees in reflections on ongoing racial inequality in the U.S. Speakers visited either the Hopkins site at the Reginald F. Lewis Museum of Maryland African American History and Culture in Baltimore or a site hosted by Berkeley in California and spoke via livestream. President Lyndon B. Johnson created the Kerner Commission in 1967 in response to protests both peaceful and violent that broke out in Detroit and other cities across the country that summer. He charged the Commission with investigating the cause of the riots and suggesting solutions to prevent them from occurring again. "Sen. Fred Harris: The Last Surviving Member of the 1968 Kerner Commission"
"Kerner@50 in your words: What happens now?" "JHU President: Lack of progress on race, equity in U.S. over past half century implicates 'all of us'"
In the summer of 1967, as racial tensions fueled by economic inequality boiled over in violent riots across the nation, President Lyndon B. Johnson tasked a small, bipartisan commission with answering three key questions: What happened? Why did it happen? And what could be done to prevent it from happening again? Wednesday, at a gathering of experts brought together to discuss the landmark document that attempted to answer those questions, Johns Hopkins University President Ronald J. Daniels asked another question: Why have we not made more progress? "Why do we find ourselves, 50 years on, repeating history in places from Staten Island to Ferguson?" Daniels said at a conference marking the 50th anniversary of the Kerner Report. "How can we recommit to understanding the issues highlighted by the Kerner Commission and find the right instruments to effect lasting change? "How a history of racist government decisions led to institutionalized poverty"
Did you know that Richmond, Milpitas, and Palo Alto all had subdivisions where it was illegal for African Americans to own a house? Those are some of the racist policies Richard Rothstein takes on in his book The Color of Law: A Forgotten History of How Our Government Segregated America. Many of the Bay Area’s segregated, low income neighborhoods can be traced directly back to discriminatory housing policies either created or enforced by local, state and federal authorities. "50 years after the Kerner Commission, minimal racial progress"
In 1967, young black men rioted in more than 150 cities, often spurred by overly aggressive policing. The worst disturbances were in Newark, after police beat a taxi driver for having a revoked permit, and Detroit, after 82 partygoers were arrested at a peaceful celebration for returning Vietnam War veterans. So little has changed since 1968 that the report remains worth reading as a near-contemporary description of racial inequality. "Interracial dating in the time of #BlackLivesMatter"
Scholars from around the country are at UC Berkeley this week for a conference exploring racial justice. It’s called "Race & Inequality in America: The Kerner Commission at 50." It refers to the commission created in 1968 by President Johnson to investigate the race riots of 1967, and explore the frustrations in Black communities. This week, we're talking to some of the speakers. Shantel Buggs is a social scientist from Florida State University. Her research explores the intersection of personal relationships and racial justice activism. Last year she interviewed dozens of women to see if civic involvement mattered for whom they chose to date. She published a study called Dating In the Time of #BlackLivesMatter: Exploring Mixed-Race Women's Discourses of Race and Racism. She spoke with KALW's Hana Baba. "UC Berkeley conference commemorates 50-year anniversary of Kerner Report"
"Kerner@50 speakers find progress scant – and the fight against racism in peril"
What does it mean to fight long-term, structural racism in the time of President Donald Trump? That’s the topic that consumed the opening evening of UC Berkeley’s three-day conference marking the 50th anniversary of the Kerner Commission Report, the government study published in 1968 examining the causes of widespread racial animosity and unrest and recommending solutions. The nonpartisan commission was created by President Lyndon Johnson and given wide latitude to examine inequality and racism in America. The final report concluded that white society had denied opportunity to black Americans living in poor urban neighborhoods and called on political leaders to make significant investments in housing, criminal justice reform, education and public health. "Experts Assess Racial Inequality 50 Years After Kerner Commission"
Fifty years after a landmark 1968 report identified white racism as the root cause of violent urban uprisings across the U.S., political inaction continues to thwart efforts to end racial inequality, according to former Kerner Commission members and staff. Former Oklahoma Senator Fred Harris, the Kerner Commission’s only surviving member, and three former commission staff members assessed the legacy of the commission during a bicoastal panel discussion Wednesday morning. It was part of a three-day conference hosted by the University of California Berkeley and John Hopkins University in Baltimore. "50 years ago, this groundbreaking report confronted America's racial struggle"
In the summer of 1967, more than 150 riots broke out in Black communities across the country, protesting racial injustice. President Johnson then called a special commission to investigate, which produced an unusual document, called the Kerner Report, which analyzed the reasons why Black communities were frustrated and rising up. The Kerner Report was revolutionary. It gave recommendations for solving issues like housing, education, and policing. Its findings were striking for the times, concluding that white society had denied opportunity to Black Americans living in poor urban neighborhoods. Today the Kerner Report turns 50. How far has the country come since then with regards to racial justice? "The Kerner Report on Race and Inequality, 50 Years Later"
Fifty years ago, the Kerner Commission issued its landmark report on the causes of the 1967 race riots in Detroit, Newark and other American cities. Convened by President Johnson and named for its chair, Illinois governor Otto Kerner, the Commission concluded that the nation was “moving toward two societies, one black, one white — separate and unequal.” The report recommended far-reaching government action, including reforming the criminal justice system and eliminating all barriers to jobs, education and housing. "50 years ago, a landmark report laid bare the racial inequality fueling urban unrest across the nation"
Fifty years ago this week, a Washington Post headline put it plainly: "Chief Blame for Riots Placed on White Racism." The newspaper had its hands on a fresh copy of the Kerner Report, the federal government's analysis of riots in black neighborhoods in dozens of U.S. cities in 1967, including violent protests in Detroit and Newark, New Jersey, that left 70 people dead. The report, which explored the causes of black unrest through interviews, data, and testimony, offered an unprecedented mainstream acknowledgement—and indictment—of the racism woven into the fabric of American society. The media was quick to devour the provocative findings, and the report itself, published in paperback, became a bestseller and national talking point. "UC Berkeley panel to discuss 1968 report blaming riots on racial inequality"
In 1968, two black San Francisco psychiatrists wrote a groundbreaking book, “Black Rage,” which examined the psychic stresses behind black anger in America. I’m sharing this because the foreword for “Black Rage” was written by Fred Harris, a white U.S. senator from Oklahoma who was part of the team of politicians that investigated the race riots that swept the United States in 1967 as part of the Kerner Commission. Harris did what would be impossible for many of the white politicians who are currently steering our country toward “greatness”: He told the truth about race. "Kerner@50: Why the Kerner Report matters for racial equity today"
Fifty years ago this week, a special commission assembled by President Lyndon B. Johnson released a blockbuster report. Tasked with investigating the causes of more than 150 civil uprisings that erupted across the nation in 1967, the “National Advisory Commission on Civil Disorders,” led by Governor Otto Kerner, squarely placed the blame on white racism. The report concluded that white Americans had denied opportunity to far too many fellow black citizens, locking them out of schools and jobs, and into neighborhoods that were far inferior to those enjoyed by whites. These conditions gave rise to, as the report described, a “burning sense of grievance” that mainstream white Americans did not understand. "Conference to examine race in the U.S. 50 years after the Kerner Report"
That’s the conclusion of the 1968 Kerner Report, a landmark set of recommendations for how to improve racial equality in the U.S. issued after violent police encounters with black Americans sparked uprisings in more than 100 cities across the country. "john a. powell talks about the Kerner Commission conference on KPFA"
"Opinion: 50 years later, nation faces same racial divisions"
It is not difficult to imagine the scene: A troubled community with racially segregated, under-performing schools and high under- and unemployment. A police shooting. A young black man dead. Civil unrest. Millions of dollars in property damage. An anxious mayor orders a curfew and appeals for calm. A reticent governor calls upon the National Guard. This could have been Ferguson in 2014 or Baltimore in 2015. This and similar scenes have played out repeatedly for a century: Washington, D.C., 1919. Detroit, 1943. Harlem, 1964. Watts, 1965. Boston, 1976. Los Angeles, 1992. Cincinnati, 2001. The underlying conditions and seething resentments. The violent trigger. The polarized public reaction and dueling public narratives. No time did this scene replay more convulsively than the “long, hot summer” of 1967, when it spread across the country in more than 150 cities. A series of police encounters triggered uprisings in the North and West on a scale never seen before. Shaken by the crescendo of unrest, President Johnson convened a special National Advisory Commission on Civil Disorders headed by Illinois Gov. Otto Kerner. "50 years later: UC Berkeley hosts conference reflecting on 1968 race report"
Fifty years ago, the federal government ordered a commission to investigate the cause of race riots that erupted across the United States in 1967 and led to the deaths of more than 80 people. Their findings, called the Kerner Report, were groundbreaking — the riots resulted from Black frustration at an unjust and oppressive economic structure. “Our Nation is moving toward two societies, one black, one white—separate and unequal,” the commision said in the report’s most famous line, which the U.S. Supreme Court recently cited in 2015. Fifty years later, the campus Haas Institute for a Fair and Inclusive Society will continue the Kerner Report’s legacy by hosting a conference commemorating its semicentennial anniversary. The conference — called “The Kerner Commission at 50 Conference” — will be held Feb. 27 through March 1, and will feature speakers such as Chris Edley, the former UC Berkeley School of Law dean; Bill Keller, editor in chief of The Marshall Project, a nonprofit news organization that covers U.S. criminal justice; and campus law professor john powell, among others.